Linksys wireless-N USB adapters come with a setup CD that makes the installation easy. This article will show you how to install your wireless-N USB adapter using its setup software. NOTE: If you have lost or misplaced the setup CD that came with your Linksys adapter, you can proceed with a manual installation instead. For more details about this, click here. Insert the setup CD on your computer’s CD or DVD drive. In the AutoPlay window, select Set up your Linksys Adapter option. NOTE: If the AutoPlay window does not appear, go to Computer for Windows 7 and Windows Vista or My Computer for Windows XP then double-click the Linksys Connect icon. 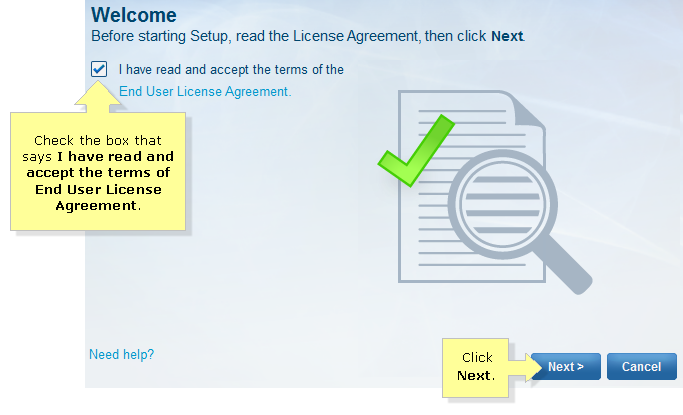 Read the End User License Agreement then check the I have read and accept the terms of End User License Agreement box. Click Next to proceed. Plug in your wireless adapter into a USB 2.0 port on your computer. 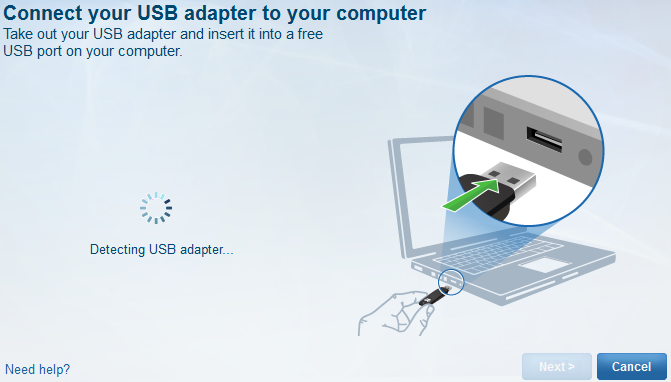 Your computer will begin detecting the adapter automatically. QUICK TIP: If you encounter an error message that says Unable to find adapter, this either means the adapter is not yet plugged in or it is not detected by your computer. What you can do is to ensure that your adapter is plugged into an available USB 2.0 port or higher, or unplug and re-plug the adapter from your computer. 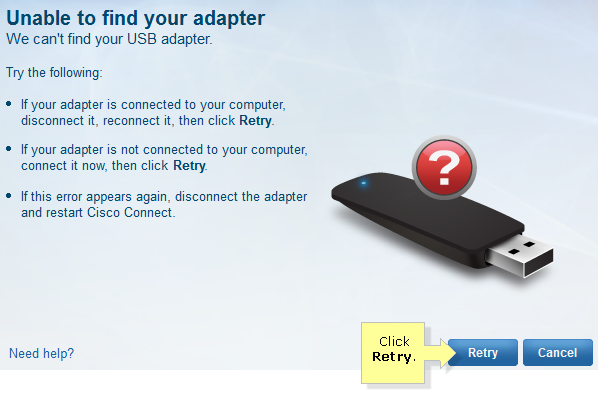 Click the Retry button to proceed with the setup. When the computer successfully detects and installs the wireless adapter, it automatically searches for available wireless networks that are within range. 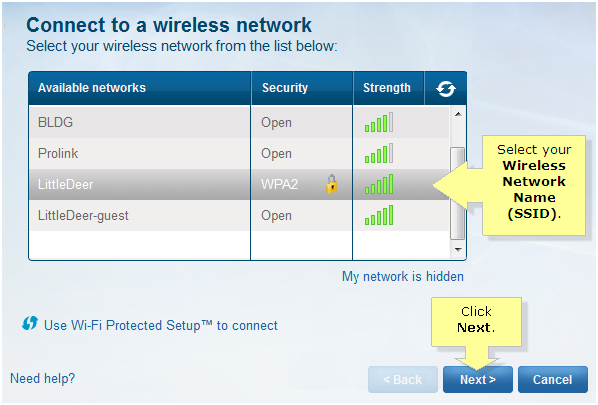 Select your Wireless Network Name (SSID) in the list and click Next. 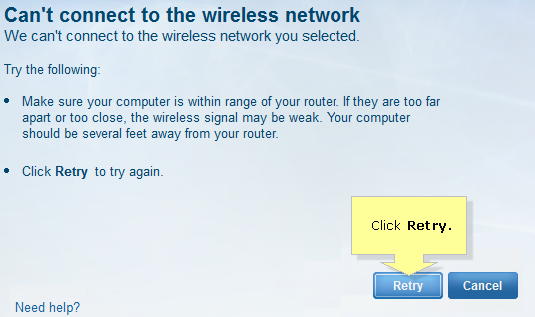 NOTE: If you encounter a Can’t connect to the wireless network error message while your adapter is connecting to the wireless network, make sure that the wireless computer is within five (5) feet of the router all throughout the setup process then click Retry. However, avoid moving closer than the 18 inch radius around your router as this is considered a wireless dead zone. If the wireless network is secured, you will be asked to enter your wireless password or network key then click Next. To know how to check your network’s wireless password or network key, click here. 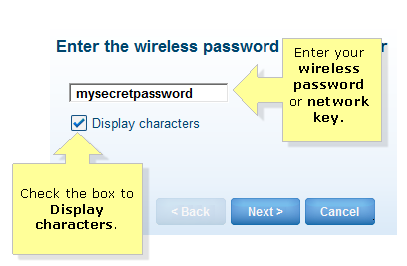 NOTE: You can check the Display characters checkbox to display your wireless password. NOTE: You can uncheck the Display characters checkbox to hide your wireless password. QUICK TIP: Your password is case-sensitive. Make sure to enter it correctly. When the setup of your Linksys wireless-N adapter is complete, you will receive a confirmation that the setup is successful. Click the Close button to exit the window. You may now test your Internet connection by opening a web browser and accessing any website.